The task is to proclaim that Jesus is the only saviour, whilst showing respect and appreciation for other religions. Correcting and purifying cultures must be done with "prudence and discretion", without using "arrogant and aggressive methods". The focus is on helping small basic ecclesial communities to mature in faith and life. The bishop of Poona laid out plans at the Plenary Assembly of the Conference of Catholic Bishops of India of the Latin rite. Chennai (AsiaNews) – In his opening address to the Plenary Assembly of the Conference of Catholic Bishops of India (CCBI) of the Latin rite, which was held in Chennai (Tamil Nadu) from 7 to 14 January, Mgr Thomas Dabre, bishop of Poona, mentioned some of the challenges that the Church faces, most notably those of proclaiming Jesus Christ as man’s only saviour whilst appreciating the country’s other religions, correcting and integrating cultural mismatches whilst being profoundly "nationalist" (i.e. patriotic), addressing the estrangement of so many Catholics from their communities through less red tape and legalism in the life of the Church, communicating the truths of faith in ways other than in the Greco-Roman tradition, and promoting popular piety and small communities of ecclesial life to restore vigour to the life of faith. One of the solutions suggested is the idea of not being “negative to other religions and adopt arrogant and aggressive methods for evangelization”, thus setting ourselves apart from what Evangelical communities do. At the same time, the Churc needs to assert the uniqueness of salvation in Christ whilst recognising the work of the Holy Spirit in other religions. 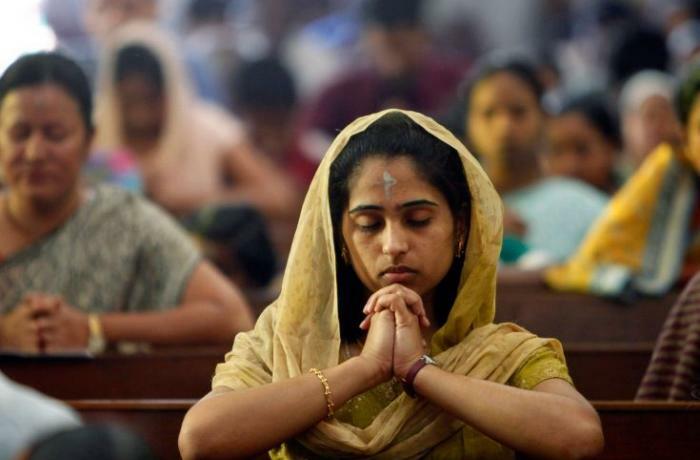 While working to correct and purify cultures (in favour, for example, of the dignity of women and Dalits), this process requires a lot of "prudence and discretion", as well as a show of one’s "nationalism" (to oppose Hindu fundamentalists who brand Christians as followers of a "foreign" god). For Mgr Dabre, "our evangelization can in no way be seen as a threat to Indian cultures and Indian heritage.” Even in the midst of "opposition, attacks and rejection" and “widespread materialism, indifference to spirituality, agnosticism, atheism and secularism,” evangelization must always take place "in joy". Here are broad excerpts of his address. “How, then, can they call on the one they have not believed in? And how can they believe in the one of whom they have not heard? And how can they hear without someone preaching to them?” (Romans 10:14). All through her history the missionary mandate has been the integral part of the self-understanding of the Church. It is on account of this self-understanding and this faith that thousands of martyrs laid down their lives right up to the present times. Evangelization helps to deal with the fundamental questions of life. Jesus answers all questions of life which always and everywhere are the overriding existential concerns of all humanity. What is man? what is the meaning of life? What is the purpose of life? What is the future and destiny of man? It is, however, an existential fact that many Catholics do not feel inspired, challenged or fulfilled with the same faith and the pastoral ministry of the Church. The evangelization and proclamation meet with opposition, attacks and rejection. In our country some are crying for a ban on conversion. The absolute demand of evangelization is non-negotiable; but how to carry it out amid disturbing and discouraging problems and challenges? This is what should constantly occupy us. This mission needs to be carried out in the key of new evangelization. “I will sing a new song unto thee, O God: upon a psaltery and an instrument of ten strings will I sing praises unto thee” (Ps 144). “They were all amazed, so that they debated among themselves, saying, "What is this? A new teaching with authority!” (Mk 1:27). “And that ye put on the new man, which after God is created in righteousness and true holiness” (Eph 4:24). “For this reason, He is the mediator of a new covenant…” (Hebrews 9:15). “Therefore, if anyone is in Christ, he is a new creature; the old things passed away; behold, new things have come” (2 Corinthians 5:17). “But according to His promise we are looking for new heavens and a new earth, in which righteousness dwells” (2 Peter 3:13). “Praise the Lord with the lyre, make melody to him with the harp of ten strings! Sing to him a new song. Rid yourself of what is old and worn out, for you know a new song. A new man, a new covenant; a new song. This new song does not belong to the old man. Only the new man learns it: the man restored from his fallen condition through the grace of God, and now sharing in the new covenant, that is, the kingdom of heaven. To it all our love now aspires and sings a new song. Let us sing a new song not with our lips but with our lives (St Augustine: from a discourse on the psalms, Ps. 32, sermon 1, 7-8: CCL 38, 253-254). "To this end, it is more necessary than ever for all the faithful to move from a faith of habit, sustained perhaps by social context alone, to a faith which is conscious and personally lived. The renewal of faith will always be the best way to lead others to the Truth that is Christ" (John Paul II, Ecclesia in America, no. 73). “I hope that all communities will devote the necessary effort to advancing along the path of a pastoral and missionary conversion which cannot leave things as they presently are” (Evangelii Gaudium 21). Pope Francis expects that “In line with the new culture in modern cities and the emerging new way of life the Church ministers should propose newer and more appealing and accessible ways of doing the ministry and sharing the good news of Jesus.” For this the schedule of the liturgy, worship and availability and the content of the prayer service, sermons and sharing the word of God and various services of mercy and compassion have to be revised and adapted. In olden times society was static and so a regular time-table and routine was fixed. In the dynamic and fast changing functional society we now need flexibility and modification in our programmes and pastoral ministry. For example, Masses have to be scheduled at any hour of the day, not sticking to a fixed schedule like in the offices in society and so on. “Evangelization must reach the places where new narratives and paradigms are being formed, bringing the word of Jesus to the inmost soul of our cities. The unified and complete sense of human life that the Gospel proposes is the best remedy for the ills of our cities” (Evangelii Gaudium,74). “Jesus Christ is the same yesterday and today and forever” (Hebrews 13:8) “Thus the holy apostle, in wise consideration of the meaning of the mystery, says: ‘Jesus Christ is the same yesterday, and today, and forever’- he knows that the mystery is always new, that the mind in understanding it will never deprive it of its freshness” (St. Maximus the Confessor, Five Centuries, Cent. I, 8-13. 2nd Reading, 4th January). Therefore, evangelical fidelity demands that the perennial faith and its newness founded on the abundant, immense and infinite riches of Christ be ever maintained in a serene, stable and dynamic equilibrium of the perennial faith and its constant newness. Evangelization demands creativity and innovation. God is ever new and ancient. “I invite everyone to be bold and creative in this task of rethinking the goals, structures, style and methods of evangelization in their respective communities” (Evangelii Gaudium 33. This is in line with the New Evangelization which has been emphasized since St. Pope John Paul II who proposed it so enthusiastically, the main components of which are: 1. New ardour, 2. New methods and 3. New expressions. 1. Regular members of the community whose faith has constantly to be deepened. 3 Attracting new believers into the fold, proclaiming the Gospel to the people of other faiths and cultures (Redemptoris Missio, 33). At all levels of the Church’s life the ministry has to be reorganized according to such target groups bearing in mind their specific situation. Exponential growth of science and technology, ameliorating conditions of life, enhancing health and life-span are in truth God’s blessings through human inventiveness, skills and imagination. However, these have mistakenly led a growing number of people to pride and people live as though man can organize his life by his own resources without dependence on God or even denying his existence. This also has fostered a widespread materialism, indifference to spirituality, agnosticism, atheism and secularism. Postmodernism which is self-referential relativism and subjectivism, rejects objective, universal and absolute truths. The situation within the Church too has reached a critical point: low attendance at worship and liturgy, failures of some of the Church ministers to live up to their commitment, lack of pastoral accompaniment, divisions, failure to adapt to the new cultures and situations and Church, etc. All this calls for new strategies and approaches and perspectives in the process of evangelization. It would be superficial, simplistic and unrealistic to implement a pre-programmed pastoral ministry. This should be kept in mind by the religious and the clergy when they set out from the secure and receptive spirit of the house of formation. The Church as a community of faith has her Doctrine, Law and Ethics which are all essential elements of Faith-life and Evangelization. We have, however, to distinguish between the essentials and the changeable, accretions of history, and time-conditioned human and social traditions. Prohibition of Christian burial for suicides, even in the case of school-going children, stricter regime of fast and abstinence during Lent, 3-hour fast before Communion, universal use of Latin, restrictions on inter-religious marriage, practice of local culture, customs and traditions, especially since Vatican II many such things have been set aside or revised. 1. Many of the faithful are not able to understand and appreciate the traditional formulations of the doctrine. Certainly, the doctrine and the truth of faith are gifts of revelation for our salvation and we should appreciate their significance and riches. However, the defined expressions do not evoke expected response, emotion and experience among some believers on account of their inability to understand and interpret them correctly. The present-day mindset and thought-pattern are not Graeco-Roman which was operative when dogmas were formulated. 2. Over the years the Church Law has been revised. Certainly, Law does illuminate and enable a consistent and well-ordered way of Church life. However, a purely literal interpretation and strict application of the Law has not helped some of the faithful to correct their ways and to live a regular faith-life in the Community of faith. 3. In modern times the Church teaching on marriage, divorce, use of artificial means of birth-control, the primary purposes of marriage, euthanasia have been opposed or ignored even by the faithful without qualms of conscience. Certainly, the Church teaching on morality has its intrinsic merit; it emphasizes the inviolable and transcendent dignity of the human person and seeks to protect the highest values of life. However, there is no reception on the part of some within the Church. Some of these concerns and problems are not addressed well enough in the pastoral ministry. Transmission of the Gospel or evangelization needs renewal of the expressions and forms of the unchanging truths of the gospel and the deposit of faith. Because it is true that in our situation people do not properly understand and appreciate the orthodox formulations. EG invites us to a renewal of the presentation of the doctrine and not to present church laws customs, laws, traditions, practices etc. as being oppressive and burdensome. The faithful should be able to breathe freely in the church. So that everything becomes good news of joy, mercy, forgiveness free of legalism (Evangelii Gaudium 41-42). We must recognize that if part of our baptized people lack a sense of belonging to the Church, this is also due to certain structures and the occasionally unwelcoming atmosphere of some of our parishes and communities, or to a bureaucratic way of dealing with problems, be they simple or complex, in the lives of our people. In many places an administrative approach prevails over a pastoral approach, as does a concentration on administering the sacraments apart from other forms of evangelization. Evangelii Gaudium 63 calls for a thorough renewal of the church at all levels and the concomitant restructuring to be in harmony with the spirit of the gospel, mercy, forgiveness, and free of legalism. The presentation of the “Uniqueness of Jesus Christ – Saviour of the world” is really a formidable challenge before the Church in India. It is the absolute faith of the Church that Jesus Christ is the saviour of the world. By His death on the cross, He has brought God’s forgiveness and eternal life, i.e., complete redemption and salvation to all humanity without a single exception. Vatican II has affirmed, “the Holy Spirit offers everyone the possibility of sharing in this Paschal Mystery in a manner known to God" (Gaudium et Spes 22). So let us not think that those of other religions are separated from the mystery of Jesus; they may well be united to Him, maybe more than us. So the proclamation of the uniqueness of Jesus should be done bearing this in mind. “The Spirit's presence and activity affect not only the individuals but also society and history, peoples, cultures and religions. “The Second Vatican Council recalls that the Spirit is at work in the heart of every person, through the "seeds of the Word," to be found in human initiatives-including religious ones-and in mankind's efforts to attain truth, goodness and God himself. “The Spirit's presence and activity affect not only the individuals but also society and history, peoples, cultures and religions. Indeed, the Spirit is at the origin of the noble ideals and undertakings which benefit humanity on its journey through history.” n.28: "every authentic prayer is prompted by the Holy Spirit, who is mysteriously present in every human heart” (Redemptoris missio, 29). We cannot be negative to other religions and adopt arrogant and aggressive methods for evangelization. This is not the approach of Jesus. “I have not come to abolish but to perfect” (Mt 5:17-19). In his Areopagus speech St Paul spoke in terms of a common foundation among religions. “Paul then stood up in the meeting of the Areopagus and said: “People of Athens! I see that in every way you are very religious. For as I walked around and looked carefully at your objects of worship, I even found an altar with this inscription: TO AN UNKNOWN GOD. So you are ignorant of the very thing you worship—and this is what I am going to proclaim to you” (Acts: 17:22-23). Paul, affirmed One God as Creator who is near everyone; he recognized them as being religious and declared the faith in the risen Lord. “Truly I tell you, whatever you did not do for one of the least of these, you did not do for me” (Mt 25:40). 2 All men are equal. God has made man and women in His image and likeness. “Father forgive them…” (Lk 23:34). The non-Christians have appreciated these words from the Gospel. Thus, the sharing of the Word of God with the non-Christians has been a great point of opportunity for evangelization. Fr. Joseph Vaz, Fr. Constant Lievens and Mother Teresa, Sadhu Sundar Singh, the great Christian scholars like Brahmabandhav Upadhyay, and Rev. N.V. Tilak and others were a huge success in the mission of evangelization, for they identified themselves with the local culture. Through them we learn the importance of inculturation, practising the Word of God and sharing the joys and sorrows of those to be evangelized. Thus our evangelization can in no way be seen as a threat to Indian cultures and Indian heritage. Our evangelization must be done in the light of our diverse situations and specially in harmony with the noble values of Indian religions and Indian cultures. Pope Francis in his general payer intention for the month of December 2018 states, “That people, who are involved in the service and transmission of faith, may find, in their dialogue with culture, a language suited to the conditions of the present time”. Authentic nationalism should be a feature of people of all religions. Faith in Christ, loyalty to the church and authentic nationalism go together. Authentic nationalism binds all citizens into unity with all their diversity of religions, cultures and ideologies. The language of purification of cultures and religious practices in the process of missio ad gentes adopted in Church documents which per se is justified, should however be very carefully and prudently handled. Certainly, all cultures must be illumined by the Word of God. Accordingly, things such as caste system, idolatry, multiplicity of Gods, the sacred cow, the ban on beef, Punar Janma (rebirth) etc., have to be reviewed and re-evaluated in the light of the Christian faith. But this cannot be done aggressively. It needs to be done with prudence and discretion, lest it incur ire and attacks. Some extremist elements have been very active, creating a climate of fear, anxiety and intolerance. Some of them are aggressive and violent. In such a situation evangelization must be done prudently with wisdom and patience. She regards with sincere reverence those ways of conduct and of life, those precepts and teachings which, though differing in many aspects from the ones she holds and sets forth, nonetheless often reflect a ray of that Truth which enlightens all men. Indeed, she proclaims, and ever must proclaim Christ "the way, the truth, and the life" (Jn 14:6), in whom men may find the fullness of religious life, in whom God has reconciled all things to Himself. “Salvation is found in no one else, for there is no other name under heaven given to mankind by which we must be saved." The Church, therefore, exhorts her sons, that through dialogue and collaboration with the followers of other religions, carried out with prudence and love and in witness to the Christian faith and life, they recognize, preserve and promote the good things, spiritual and moral, as well as the socio-cultural values found among these men (Nostra Aetate 2). We cannot presume that we understand what uniqueness really and fully means and implies. Therefore, the role of Jesus, one and only Saviour of the world can only be stated in utter humility before the divine mystery. Statements about God are confessional and though intrinsically reasonable they are not fully accessible to reason. God always remains a mystery. We must complement faith-statements with our commitment, total surrender, experience and testimony. It is such a witness of life that is the more reasonable and persuasive way of proclaiming the uniqueness of Jesus and that is what the martyrs have done all through the Church’s history. Arguments and proof do not necessarily convince people of religious truths. Evangelization, which is a fundamental imperative, is, however, a comprehensive and all-inclusive mission, comprised of multiple dimensions: verbal, dogmatic, intellectual affirmation; spiritual; psychological; physical; social; cultural; political; cosmic. When the Church community of faith lives these multiple dimensions of the fullness of life that Jesus generously offers it becomes a credible witness of the uniqueness of Jesus Christ. Make a joyful shout to the God of Jacob (Ps 81). For the kingdom of God is not mean food and drink; but righteousness, and peace, and joy in the Holy Spirit (Romans 14:17). “Come to Me, all who are weary and heavily burdened [by religious rituals that provide no peace], and I will give you rest [refreshing your souls with salvation]. Take My yoke upon you and learn from Me [following Me as My disciple], for I am gentle and humble in heart, and YOU WILL FIND REST (renewal, blessed quiet) FOR YOUR SOULS. For My yoke is easy [to bear] and My burden is light” (Mt 11:28-30). The faith therefore should not be burdensome. Jesus ministry brought joy to children women, the poor, the sinners and the repentant. The message of the beatitudes is a message of blessing and the joy of salvation to all. Even to the enemies he brought joy by His message of forgiveness culminating on the cross. The Church must enable all to have a joyful encounter with Jesus. Since the joy of Christ is for all, the Church must enable all to encounter Jesus. Highlighting the importance for the parish, the Pope says, the parish is the presence of the Church in a given territory, an environment for hearing God’s word, for growth in the Christian life, for dialogue, proclamation, charitable outreach, worship and celebration (Evangelii Gaudium 27, 28). We have to realise the key importance of the parish for the mission of evangelization. The big programmes at the level of the Vatican, FABC, NBCLC AND DIOCESE ARE doubtless of great significance. The real change, however, has to take place at the grassroots level. So it is at the level of local parish communities the desired restructuring and renewal has to happen, otherwise all great plans and policies and decisions remain on paper. This would also demand from all of us who operate at higher levels that we should descend to the local, grassroots level. There are many forms and ways of evangelizing. No movements and associations should be avoided if they are legitimately instituted. Importance of Word of God through many groups, such as Bible study prayer group, Charismatic Renewal, St. Vincent de Paul and others. Everywhere a passage from the Holy Bible should be shared and reflected upon. “Other Church institutions, basic communities and small communities, movements, and forms of association are a source of enrichment for the Church, raised up by the Spirit for evangelizing different areas and sectors” (Evangelii Gaudium, 29). It appeals to the heart of the people. Sentiment, spontaneity, enthusiasm, felt experience, sacrifice and constancy are some of the striking features of popular piety, observed at Vailankanni, Jhansi, Unteshwari Mata, Mount Mary, Lourdes, Fatima etc. As the Biblical and Church history shows, Christian religion has been a mass movement. The popular devotion keeps the faith alive; they bring vitality to the Church. They are a golden opportunity for an integral and comprehensive evangelization. Of course, they need to be guided and enlightened, by pastors who should guide encourage these with their participation (Evangelii Gaudium 70). Sharing the Word of God is one of the most important focal points of SCC. There are so many SCC’s and so many stories of success and joy following the sharing of the Word of God. These are groups of Christians who, at the level of the family or in a similarly restricted setting, come together for prayer, Scripture reading, catechesis, and discussion on human and ecclesial problems with a view to a common commitment. These communities are a sign of vitality within the Church, an instrument of formation and evangelization, and a solid starting point for a new society based on a "civilization of love" (Redemptoris Missio 51). Such effective and fruitful models must be replicated according to situations, e.g. Krist Bhaktas, charismatic prayer, Vincent de Paul, Focolare, popular devotions and piety, etc. We the ministers of the Church must welcome and promote whatever helps any people to be attracted to Jesus Christ and receive a share in the fullness of life that he brings. Let us go ahead trusting in the Lord of History and in the maternal protection of Mary, the Star of evangelization. “The Task of the Latin American Bishops”, Origins 12 (March 24. 1983), p. 661.